Earlier today, Jan. 14, the United States Mint released two 2016 $5 Mark Twain Commemorative Gold Coins. They are available in proof and uncirculated collector qualities and at introductory prices for a limited time. Silver editions with different designs will follow later. Mark Twain was the pen name of Samuel Langhorne Clemens, who was born on November 30, 1835 in Florida, MO. Clemens was raised in Hannibal, MO near the Mississippi River which would serve as a source for many of his later writings. His subject matter was extremely varied but often touched on the troubling concepts surrounding the American Civil War and race and economic inequalities. Clemens was responsible for such classics as The Adventures of Tom Sawyer and its sequel The Adventures of Huckleberry Finn. Nearly every book he wrote is still in print, with more than 6,500 editions translated into 75 languages. Both the proof and uncirculated coins are produced at the U.S. Mint’s facility in West Point which is indicated with a mint mark on the obverse just below the year. The reverse (tails side) of the gold coin features a steamboat on the Mississippi River. “UNITED STATES OF AMERICA,” “$5,” and “E PLURIBUS UNUM” complete the design as created by AIP artist Ronald D. Sanders and sculpted by United States Mint Sculptor-Engraver Joseph Menna. Limited to a combined 100,000, these coins are struck with the same basic specifications as other modern U.S. gold commemoratives. That includes a composition of 90% gold and 10% alloy with a diameter of 0.850 inches. Weighing 8.359 grams, each has about 0.242 troy ounces of gold. 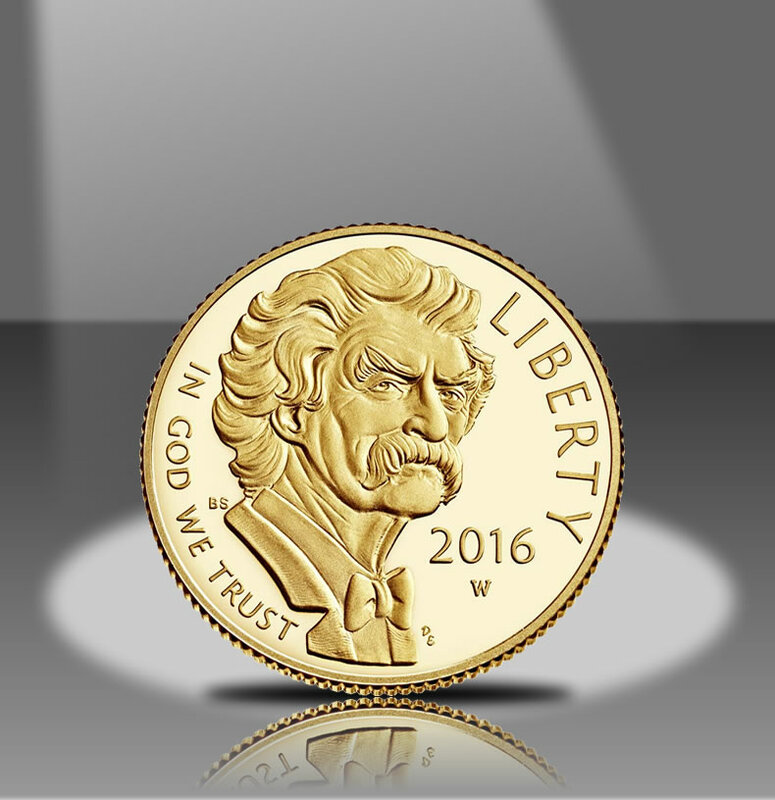 Order 2016-W $5 Mark Twain Commemorative Coins from this U.S. Mint online page or call 1-800-USA-MINT (872-6468). 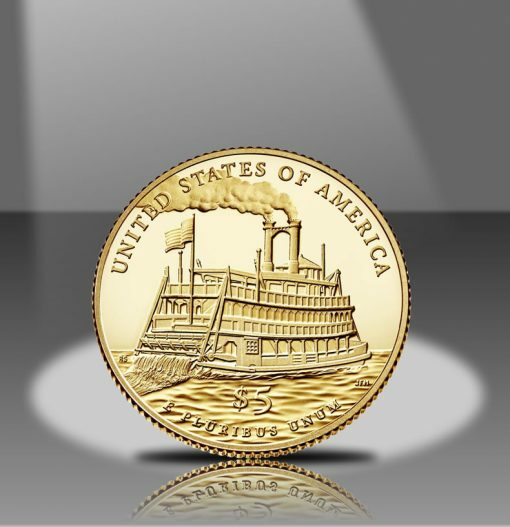 The proof gold coin is $364 and the uncirculated gold coin is $359, each $5 less because of introductory pricing. Regular prices kick in at 3 p.m. ET on Feb. 16, 2016. Also, pricing can change up to weekly depending on the latest weekly average of LBMA gold. The current prices are based on a gold average that sits within the range of $1,050.00 to $1,099.99. Prices include surcharge amounts of $35 for each gold coin. The collected funds will benefit museums and educational programs dedicated to Mark Twain. Just purchased a 2011 Army $5 gold unc, 8062 mintage for $320. Will have to wait until silver Twains go on sale. I think these will remain on sale for a long time. Totally forgot to place an order today and the mint is already saying they’re unavailable. I don’t believe they’ve sold 100,000. I also don’t understand why just because they’ve sold all those they’ve already minted they can’t keep taking orders until they reach the max mintage. I think they’ve got the idea that if one places an order they should ship that day and don’t realize that waiting for more coins to be available before allowing more orders is the same delay one would experience if they ordered and the coins hadn’t been minted yet. Jim, I just read that this morning. Mike “Sold Out, Limited Editon” Mezack will be hawking his coins tonight (1/15/16) on HSN. I’m wondering if he’ll be hawking the new Mark Twain coins. And he will probably have them with First Day of Issue labels too …. I don’t see how that sorry excuse of a man sleeps at night. Even Mr. M. M. wouldn’t offer the U.S. Mint’s 2016 Mark Twain $5 gold commemorative coins that were offered starting yesterday on his 2-hour HSN coin show tonight would he!? LMAO. He has done worse than that as you well know ! I feel sick to my stomach now just watching his snake-oil salesman tactics. It is like watching a bad car wreck! It is sickening, isn’t it. If that’s what’s actually happening (and I don’t doubt it) it kind of takes the fun out of collecting. It’s too bad if the mint just tosses rejects back in a sell it again pile. It’s unfair to everybody else to resell somebody’s reject. Maybe they should charge a restocking fee for melting, creating a new blank, and restamping the blank into a new coin. Then those who reject a new coin because it isn’t perfect can pay to have a perfect coin minted. I’ll be interested to see what the numbers are in the next couple weeks. “Back Order” for the MT gold proof ..
Looks like the “Back Order” date for new inventory is March 15th. Mike and the rest of you guys rock with your insightful comments. I wasn’t aware of the “printing issue” for the Mark Twain silver coins until you posted it. Im dumb-struck here in Canada…this is crap that such a prominent mint could/would even consider such dealings with those who not only pay the wages from taxes paid by your honorable selves from the massive profits reaped from our purchases & I surely hope they read these followings ‘plaints and get their collective arses in gear. Thanks for all your input folks…..I was so close to ordering just then! The back order story is that they are in the process of making more inventory but it won’t be available until March 15, 2016. This is well past the introductory discount expiration date of Feb 16, 2016. So, I’m ordering a coin now to see if 1 – I can lock in the introductory discounted price (assuming gold stays in the same range) and 2 – if the price of gold changes in the next 2 months will I be charged at today’s gold price or will I be charged at the March 16 gold price. Gold has been hanging in the 1050-1100 range for a while but it’s been a lot closer to 1100 lately. Just a quick note about your question. When you place an order for any precious metals product & they accept your order (with a confirmation #) you lock in the price of that item(s) at the price quoted on their website that day (even on backorder items). Of course there is always “fine print” that basically states they can refuse to fulfill any order at any time for any reason. But that rarely happens for any reason. Good luck with your collecting Jim! Thanks. Now I guess I hope the price of gold goes up so it looks like I got a good deal. I bought the MT Gold Proof on the first day and I’ll receive it next week. However, notwithstanding the fact that the proofs are not available right now and looking at the overall numbers, maybe I’ll buy the uncirculated coin too since those numbers are likely to be much lower overall. This is also usually true for all the other gold coin offered by the US Mint. Looking at the historical numbers for recent gold coins, uncirculated coins sold at a rate of roughly 50% or less of the proofs. As a collector, I personally like the proofs much better from an aesthetic point of view. But as a long-term precious coin investor, the uncirculated ones seem a better investment in the long-run. Any thoughts about this out there? 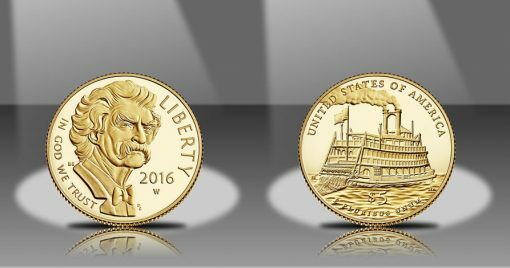 Correct me if I’m wrong, but those that receive their “Mark Twain Proof” coins on the Backorder date of March 15th, won’t have “First Strike” eligibility. I’ve never gotten any of my coins graded, but from what I observe, the “First Strike” coins seem to bring a premium.